The Asset 360 page comprises four tabs (Overview, Schema, Policy, and Audit). These tabs contain dashboards that provide an overview of your asset collection. 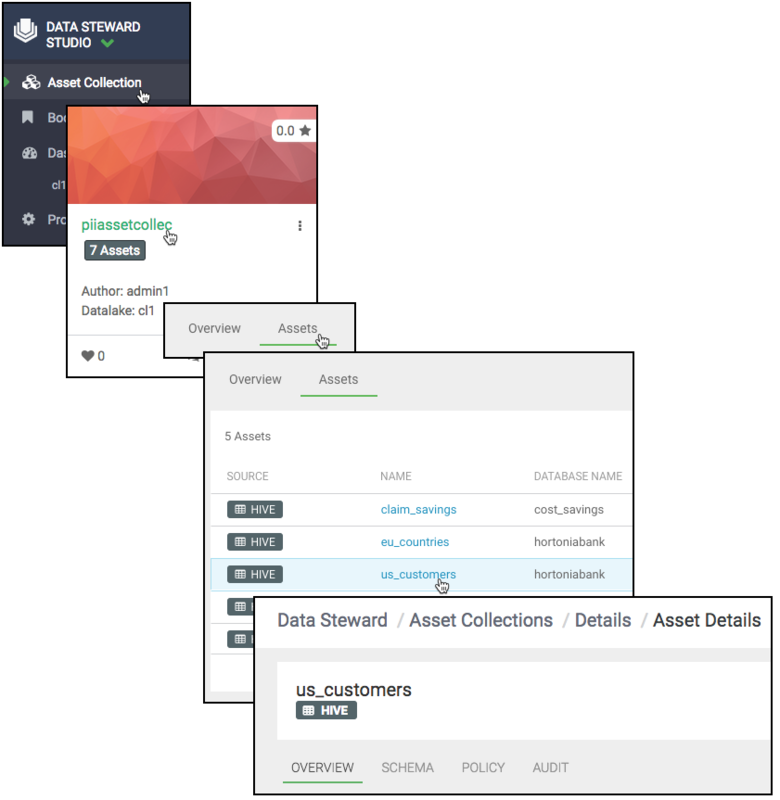 The Asset 360 page can be accessed from Asset Collection > Select one asset collection > Assets > Select one data asset. This brings you to the Overview tab, the first of the four tabs that form the Asset 360 page. Overview: Displays an overview for the data asset. Lineage: Shows the chain of custody for the data from relevant metadata repositories such as Apache Atlas. Lineage shows both upstream paths (lineage) into and downstream paths (impact) out of a given asset. Users: Displays top 10 users for the data asset. Access types: By action and operation type. Schema: Displays the schema of the data asset for structured data (such as Hive tables) from the relevant metadata repositories (such as Atlas). You can also view the shape or distribution characteristics of the columnar data within a schema based on the Hive column profiler. Audit: The data asset audit logs page shows both most recent access audits from Apache Ranger and also summarized views of audits by type, user, and time window based on profiling of audit data. Asset 360 > Overview displays all the Apache Atlas metadata associated with a particular data asset. From Asset 360 > Schema, you can view the schema of the data asset for structured data (such as Hive tables) from the relevant metadata repositories (such as Atlas). Asset 360 > Policy displays all the Apache Ranger policy details associated with a particular data asset. This helps you understand how data access is secured and protected: what users can see what data (or metadata) under what conditions (security policies, data protection, and anonymization). Asset 360 > Audit displays all the Apache Ranger audit events associated with a particular data asset. This helps you to view who has accessed what data from a forensic audit or compliance perspective, and to visualize access patterns and identify anomalies.